ELEVATED THREAT FOR FLASH FLOODING THIS AFTERNOON THROUGH FRIDAY MORNING. A storm system will bring periods of heavy rain to the region this afternoon through early Friday morning. Flash flooding is expected, especially in the "elevated" area. Localized rainfall amounts of more than 5" are possible. A Flash Flood Watch is in effect for northeastern Louisiana and portions of central Mississippi. 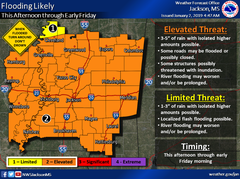 Continue to monitor weather conditions in your area for updated information through Friday.